Hi! It’s a great day to travel or to plan a journey and it will be even more beautiful because we’ll do anything in our power to make your trip more enjoyable. If you’re not in a hurry than maybe you will offer us 2 minutes of your time and read below. We are more than a transport company, we are a family and we warmly embrace you because, for us, a trip is more than just a road crossing. 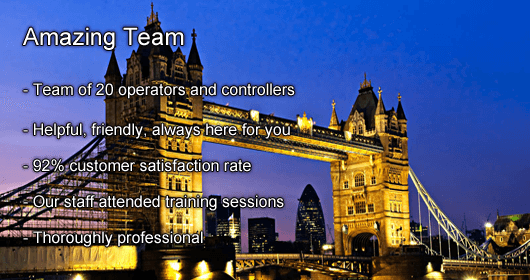 We are a team of well trained, friendly people that work in the spirit of customer services and every day we perfect ourselves to meet all your requirements of safety, punctuality, flexibility and comfort, promoting client welfare at all times. 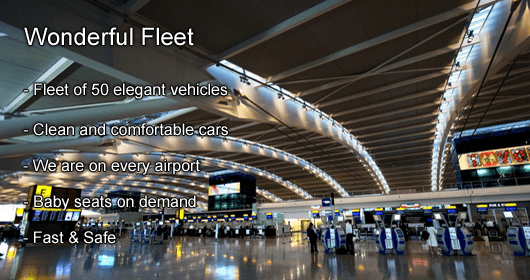 247 Gatwick Airport Transfer is a company that works on the private hire market for more than six years and we compete with more than 600 minicab companies. Our mission is to provide professional minicab transfers, taxi from Gatwick to london Airport at affordable prices and we apply this mission for each transfer that we do. Our efforts have been rewarded by the LPHCA with a 5 Star Ration for excellent London Gatwick Taxi Transfer services. This award and the continuous positive customer feedback that we get daily makes us believe that we are “on the right path”, betting on continuous promotion and application of high standards of comfort, safety and reliability. If you want to have a wonderful trip like taxi from Gatwick to London, no less than 90 vehicles are always ready to go pick you up and take you anywhere you want in a fashionable and comfortable manner. 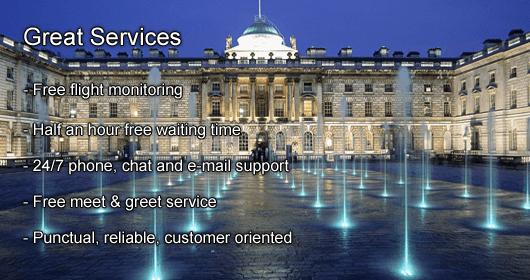 All you have to do is give us a call, e-mail us or click the chat button on the bottom of the screen and you can already consider your journey already booked at taxi from Gatwick to London. In addition to this you can always book online taxi from Gatwick to London via our smart booking system, click on the Get Price button and get your taxi from Gatwick to London Transfer service confirmed instantly. And of course, if you were satisfied or dissatisfied you can leave us a testimony. 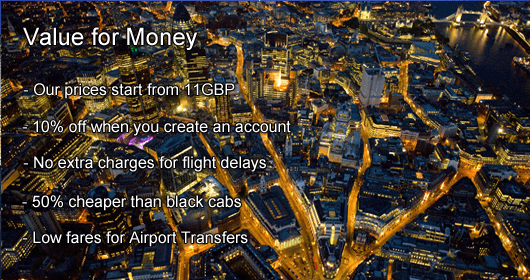 Through your opinions and suggestions we will be able to improve our services like taxi from Gatwick to London. You can find us at the following address: 105 Mayes Road, Office no. 7, London, N22 6UP. Thank you for taking your time to read our letter to you! Located at 47.5 Km south of Central London area, Gatwick Airport is rated as the second busiest London airport in terms of passengers traffic. Although it operates as a single-runway airport its two terminals North and South accommodate more than 45 million passengers a year. If you find yourself in the position of searching for a convenient taxi to Gatwick transfer, then you have come on the right page. 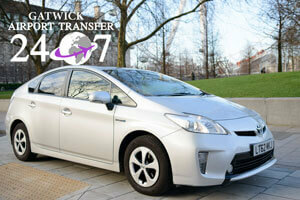 Try 247 Gatwick Airport Transfer for your next taxi from Gatwick to London journey and you won’t be disappointed. More than 7 years of experience in Private Transfers area and numerous awards for excellent customer service is what recommends us to you as a trustworthy partner for your London transfers. Besides that, our 92% customer satisfaction rate and the numerous positive clients reviews make us confident that working day by day to improve our service will only get us in the right direction. On top of all the above-mentioned reasons for which you should book your taxi from Gatwick to London transfer with us, you can always obtain some free of charge services for your rides. You can find many more reasons to book your taxi to Gatwick with us by checking our latest updates and news on www.247gatwickairporttransfer.co.uk . Once in London we recommend you not to miss some of its top attractions like: Buckingham palace, Big Ben, London Bridge, Tower Bridge, St Paul’s Cathedral, Oxford Street, Westminster Abbey, Green Park . And don’t forget that if you are in need for a ride to your hotel we are always available to your requests. We are active members of the Confederation of Passenger Transport UK - CPT an important representative for the coach and bus industry recognized by the Government of United Kingdom. Since 2015 the company is member of the European Tourism Association - ETOA a lead organization in the tourism sector of activity.